Spanish illustrator Nacho Diaz isn’t afraid to show off his influences, whether he’s drawing Godzilla re-enacting a Miley Cyrus video, a Super Mario/Doctor Who mashup, or Wall-E with Groot from Guardians of the Galaxy. The pop-culture illustrator has been working primarily with video game characters since 2009, and many of his designs are available on t-shirts that he sells through his online store. He’s also got lots of other work inspired by other pop cultural icons, from The Godfather to the Muppets. 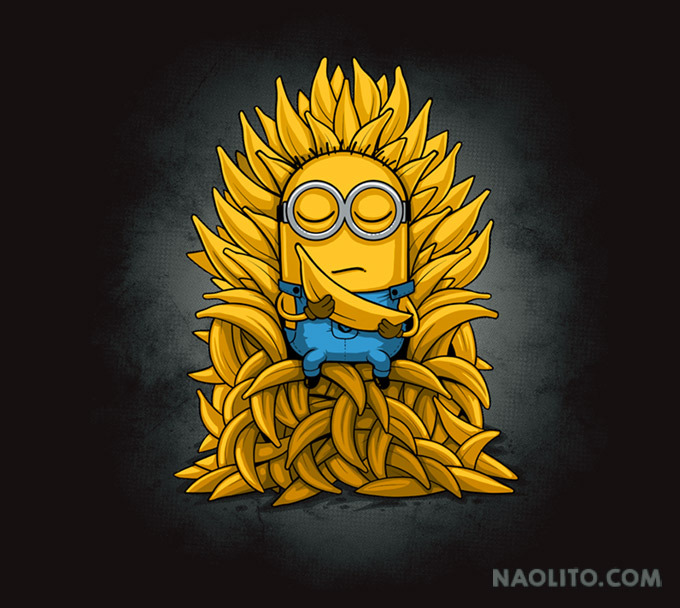 In one piece he even mashes up Game of Thrones with Minions. While Diaz lives near the southern tip of Spain, his shirts are printed in the United States, so domestic shipping won’t cost an arm and a leg, either. Also, for those who prefer wall art to wearable designs, he has a series of limited edition prints which are currently available through Brooklyn’s Bottleneck Gallery. Some of the designs sold out very quickly. Here’s a selection of Diaz’s images from over the years, some of which are still available through the gallery and all of which can be found at the artist’s web shop.